Dark Queen » Witchcraft. » Curious facts about the Witches. » MODERN WITCHCRAFT, PT. 4. The Ancient (Egyptian to Babylonian) Period stretches from 750 to 300 BCE. The Hellenistic (Greek) Period stretches from 300 to 30 BCE. The Roman Period stretches from 30 BCE to 500 AD/CE. The Medieval Period (“Middle Ages” or “Dark Ages”) stretches from 500 to 1500 AD/CE. The Renaissance Period (including the Reformation) stretches from 1500 to 1700 AD/CE. And the Modern Period from 1700 to 1900 AD/CE. Admittedly, these divisions are flexible and highly contested, even arbitrary, and are made based on which historical event you prefer. For example, Rome falls to Germanic armies in 476 BCE and yet I “round” that out to 500. Further, Rome ruled for over a thousand years, which is not reflected here given the significant contribution of Greece to Western Civilization. Even further, these divisions do not distinguish between “high” and “low” eras within periods. View it accordingly – if I seem to be playing loose with time markers, that is because I am. So far I have been discussing ideas more than rituals, and ideas tend to germinate over period of time, not like Archimede’s “eureka!” More, the history of witchcraft is known by gaps and imprecisions or especially records not of their own making which benefit their persecutors and marginalize the true history of witches. 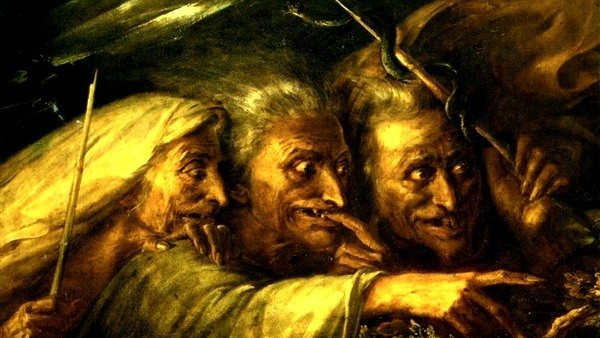 Defining a witch is not an easy task and discussion of witchcraft in Western culture must be grounded in a specific context, which has been done previously here (part 1), here (part 2), and here (part 3). From the 15th century onward, scholars sought to define and redefine witchcraft by looking to ancient sources, mostly through references to the Bible, to prove the validity of their beliefs. As discussed thoroughly already, witchcraft was especially hard to define with the confluence of ideas during the Renaissance and the social turbulence across all of Europe that heightened fears and brought about all manner of accusations. The only certainties were that witchcraft was outside of the control of the Catholic Church, was traditionally practiced by women, and involved some kind of spiritual experience. This, as should be clear, could have meant anything, allowing a great deal of latitude in the persecution and execution of women. Jean Bodin, a well known 16th century French political theorist, argued that witchcraft was the manner in which individuals, by consorting with the devil, committed malefic actions and obtained their wishes but again this is a very loose definition. Nevertheless, by the 16th century, witchcraft was fixed in the European cultural landscape. In earlier centuries, witchcraft had been tolerated for the most part – Judaism took great issue with the practice, whatever it might have been (the Hebrew Scriptures are rather vague and give wide latitude for persecution as well) – because it was seen as an aberration, a folk religious practice, or as nonsense. But then by the early modern period, both Catholics and Protestants came to accept the firm reality of witchcraft in their midst. Witchcraft was a rival to their own religious practices, albeit in a passive way. We have numerous accounts of Christians persecuting witches, but none the other way round. But what exactly are we talking about when we talk about witchcraft? Until now, I have been trying to set up a context for the origins of Modern witchcraft. Like all practices, witchcraft is made up of seminal ideas and reactions to those ideas and because a definition of witchcraft is so elusive, I felt it important to frame and ground these origins with the social conditions out of which witchcraft as we now know it arose, noting important names and moments to arrive here: with a direct discussion of witchcraft today. By fixing such a determined boundary of otherness for witches, a few scholars argued that the practices they determined to be witchcraft were illogical, even irreligious and thus a rival for the future Western, even Christian estate they envisioned. Witchcraft, as discussed previously, as we now know it is primarily a Western summation. That is, when one speaks of a “witch” one does not envision a tribal leader, a shaman, or protector. One sees in the eye of the mind a haggard old woman with loose teeth and wrinkles, crouched over her cauldron brewing some sinister brew with plumes of skull and crossbone steam hovering over the roil. Witchcraft includes this, certainly, but the key turn here is that witchcraft – though often depicted this way in the West – is inherently independent of the West. This is a priamry reason witchcraft is seen as a matrilineal practice, because it stands apart from the Western patriarchy. As discussed previously, nothing is so unsettling to the West as a firmly independent woman who thinks, feels, believes, and acts for herself. Even the idea of witches worshipping Satan is a strong effort by Western thinkers and theologians (always male) to suppress the authenticity of female-centered, led, and fixated witchcraft. While the craft may include Satanic elements, again, it requires no man, not even the king of demons. Stretching out our scope, we would be keen to remember that the forms that we commonly refer to as witchcraft in other cultures (Asia, Africa, South America, etc.) is grouped together as “witchcraft” only in the sense that is was described so by Europeans who placed these activities in their own peculiar cultural frame of reference. In parallel, we might say a cake, a loaf, a scone, and pasta are all technically bread but to do so requires that we ignore distinctions which prevent us from toasting our pasta before buttering it in the morning, or dipping cake in the soup pot. These kinds of witchcraft, the “Oriental” kinds of witchcraft are commonly dismissed as “folk religion” or strange behaviors, differing markedly from the generalized European variety of the 15th and 16th centuries because of the peculiar role of Satan, ultimately. Because of the creation of a rival to God during the rise of Dualism during these centuries and the development of the Christian concept of Satan, “witchcraft” is associated with Satan when this is not true. Again, it is like saying all Jews have long beards. While this is true for many, but certainly not true for all. The false generalization often inhibits true understanding of witchcraft which, again, historically has not needed or even wanted to trade communal patriarchy for cosmological. Rather, for many witches, the rejection of a male god was what drew them to witchcraft to begin with. But even though this is true, it is “true” in a very modern sense. That is, we are committing an act of anachronism (the act of attributing a custom, event, or object to a period to which it does not belong). We cannot read history as though Feminism was present before the 20th Century and insert the practice of witchcraft as an act of disestablishmentarianism, though parallels might be drawn – even convincingly. However, the fact remains that Feminism as we now know it is a movement of the 20th century, not the 2nd or even 15th, 16th, or 17th centuries which we have been discussing so far. This may be one of the reasons I am a bit “hands off” when it comes to historical reconstruction. Dates and times are finite, but I there is a temptation to put causes and meanings where they do not belong. I might say, the truth is bad enough without us making it worse and so I would rather practice a bit of reservation instead of inducing meaning. It is sufficient, however, for me to point out that while most religions are patriarchal (male-dominated), those practices and beliefs assigned to “witchcraft” tend to be matriarchal (female-dominated) and this is unignorable. Women have always been spiritually inclined, just as men have been. And women, like men, have not always gone along with the established order. Let me not, however, commit the same offense as the Inquisitors did centuries ago and aggregate “all of them” together under the banner of “witches.” The Bible, which I spoke of in the first part of this series is overwhelmingly patriarchal in nature though – thankfully – theologians and historians are doing a phenomenal job now returning a sense of the feminine divine to scripture and reinvigorating both Judaism and Christianity. The anti-female rhetoric of scripture has been a hallmark of the Hebrew and Christian scriptures for centuries and we are now thankfully moving towards the gender-inclusivity so obviously intended by the original translations. It is no wonder then that we see traditional, even fundamentalist sects of both faiths taking issue with gender-inclusive languages as an “evil” practice when women have been shunned for so long. But, as they say, let us not get too caught up with all of that. It is enough to note it as a framework and move past it, thankful for the changes being made and the progress of civilization and thinking. The leading speculation by historians, anthropologists, and genetic biologists is that humans came from primitive origins. At some point, labor was diversified along gender lines, creating the “hunter and gatherer” role for males and the domestic, child-bearing role for females.Without the benefit of even rudimentary medicine, when a human became ill or injured, there was nothing to be done except pray to the gods. During those early days, it is believed that women developed medicinal arts because they were more stationary, even stable enough to trade information and learn from one another the value of homeopathic treatments and health, and assisted one another in what we might think of as midwifery by assisting one another with pregnancy and delivery, creating or combining the plants and herbs that would aid in pain and so on. This, in a very profound way, contributed to idea of women as life-bearer, life-giver, and life-sustainer. Before long, we see evidence of female deities and worship expressed through plant or grain-based sacrifices. This seems a very rational evolution in the human religion because, after all, women were situated in prominent roles, benefited from their station, and easily propagated the idea that, yes, if the gods existed, they were probably women. The goddesses gave plants as sustenance and health for humans, and so they must be worshipped every year by planting seeds and awaiting a bounteous harvest from the land. Already, you can see a strong tie developing between female bodies and ecology – what happens to one happens to another and our language surrounding gardening earth care reflects that. Historically, the first forms of religion were vegetation religions and fertility cults, though the unexplainable or “magical” also played an important role. This not to say that these early spiritual practices were without measures of control; magic, through incantations and formulas, sought to control nature and in some sense harness nature and the elements towards predictability. The primary shifts we see away from regional folk beliefs or spiritualism towards “religion” begin with a shift away from the chaos of the cosmos towards explanations. We must note a strong distinction between the later practices of male-dominated society in the late Middle Ages and Renaissance towards rationality, reason, and sequential logic to explain the ineffable and transcendent. This will not take place for many centuries. As Karen Armstrong explains in her work, A History of God, the first humans were developing their ideas about the gods, worship of those gods, and what would become known as religion but these activities might not be called “religion,” per se. During the ancient period, there was not a great deal of concern for structure or hierarchy of the gods. Instead, there was attention to narrative – an origin story or purpose for their abilities – and for the practices that appeased each god. It was assumed that gods existed and proof for the humans was to be found all around them – how else could seasonal changes in the crops be explained, or sudden death by sickness than by the will of the gods in response to sacrifices brought to them? Instead of theologizing, the main concern was how best to please the gods in practical ways. If the delivery of “the sweat of the brow” was not sufficient, then a life must be given. Out of this springs human sacrifice, even tattoos and genital mutilation to show gradation of devotion, even “ownership” by a god, as with Cybele or even YHWH. Instead of theologizing, the main concern was how best to please the gods in practical ways. If the delivery of “the sweat of the brow” was not sufficient, then a life must be given. Out of this springs human sacrifice, even tattoos and genital mutilation. In light of this, we might read Genesis much differently. Genesis is a story of a family, yes, but a human family whose origins are cloudy and becoming more permanent. There is a separation from the gods, a definite distinction between the holy (untouchable and unseen) and profane (nakedness – touchable and pleasing to the eye), there is a difference in sacrifices (Abel’s animal sacrifice is more pleasing than Cain’s of the field), there is an awareness that humans will not always live peaceably with one another (Cain slays Abel and moves to the land of Nod) and so on ad infinitum until the present state. Witchcraft, then, as stated previously, will run parallel to this. We might say in some sense that witchcraft is the religious practice of Cain – isolated, dependent on nature and the elements, magical in an unknown sense, and still making sacrifices from the field and forest rather than the slaughter of animal or human life. Meanwhile, moving concurrently, the first parents have more children who continue on towards “progress” with sacrifices and the legitimization of formalized religion. Religion comes from an awareness that magic (“Cain”) is insufficient to control and order the world. The devotee must surrender his or her will (where necessary, their life or the life of another) to the power of the gods, requesting mercy and favor. Still, it is undeniable that religion retains a number of aspects that may be considered magical. Even the most sophisticated individual engages in practices today that can only be described as attempts to control an outcome and order their world. The lottery is very much a vehicle of chaos and requires one to suspend the laws of belief to make a sacrifice (money) for the hope of something magical to take place (one dollar becomes one million dollars). Witchcraft, or the notion that you could use mischief or evil to obtain powers is grounded in the belief that magic exists and that the world is more simple than “progress” would permit us to believe. Inherently, witchcraft believes the world is divided into contending powers of good and evil. Again, using the biblical narrative as a parallel of explanation, I point to the story of Cain and Abel. While Abel made a sacrifice of animals, Cain was overcome with anger and malice and kills his brother. He does not make of Abel a sacrifice but instead, overcome by darkness, kills him, realizes what he has done (his good was overcome by evil) and repents by exile. Cain in no way partakes of the system of sacrifice, but instead subscribes to binary thinking – good and evil – and recognizing the power in either, runs from it. Because we might see witchcraft standing apart from religion then, we might in some sense (and of course borrowing religious language here) say that it can be “redeemed” for good ends. Instead of witchcraft being derivative from religion, we might instead focus on the role of good and evil, that either might side of the human-cosmological relationship might be used to evil as well as good effect. Indeed, just as witchcraft borrows from religious thought, we might say that religion borrows from witchcraft. The neo-Buddhist teachings of Wayne Dyer, Rhoda Bryne, even Oprah depend on recognizing the distinction between good and evil in one’s own life (especially spiritual experience) and harnessing the power of either. This may be a rather shocking accusation, but it is made with no hint of ill-will or malice. Rather, it is a curiosity that depends our attention and could perhaps explain why forms of religion are so resistant to the new wave of “spiritual but not religious” voices (note again the way that we speak of that which is spiritual being outside of the confines of “religion”). When we speak of “welcoming light into our relationships” or “utilizing dark energy at work” to get a promotion, we are undeniably using the language and mentality of witchcraft.